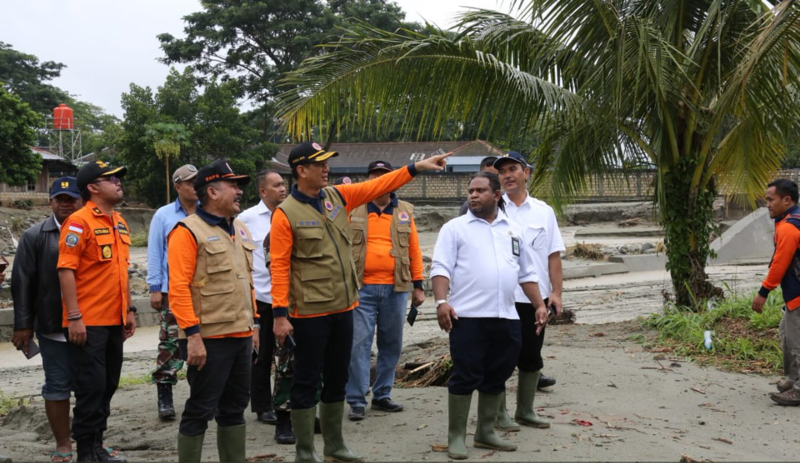 Following a flash flood in Jayapura regency and landslide in Sentani regency in Papua province Saturday (16/3), a total of 1,613 joint team personnel from 23 agencies and institutions have been deployed to handle the disaster-hit areas. The number of victims also continues to rise given the vast area affected by the disasters. Head of Data Information and Public Relations Center of the National Disaster Management Agency (BNPB) Sutopo Purwo Nugroho in his press release said that as of Tuesday (19/3), death toll rose to 89 people, comprising 82 people who died from flash flood in Jayapura regency and seven people who died from landslides in Ampera, Jayapura City. In addition, 84 people were seriously injured and 75 others sustained minor injuries. According to Sutopo, a joint search and rescue (SAR) team on Monday (18/3) have recovered 13 bodies, comprising four bodies in Sereh Tua Village, two bodies on Lake Sentani, three bodies at BTN housing complexes, two bodies at BTN Nauli 2, one body at BTN Citra Buana, and one body in Hobong Village. “The joint SAR team will continue to search for victims who are still unaccounted for,” said Sutopo, adding that as many as 74 people are still missing, among others, 34 people from Milinik Village, 20 people from BTN Gajah Mada housing complex, seven people from the Inauli Housing Complex, four people from Bambar Village, two people from BTN Bintang Timur housing complex, one person from Sosial, one person from Komba and three people from Taruna Sosial. Sutopo went on to say that the number of people who have been displaced has also continued to increase. “Many people choose to take shelter in evacuation centers as they are afraid of subsequent flash floods. As a result, the centers are packed,” he said. In the meantime, public kitchens, health service centers and command posts have also been established. To date, the displaced residents are in urgent need of toilets, clean water, food, mattresses, blankets, proper clothing, generators, kitchen appliances, psychosocial assistance, and so on. Several facilities and infrastructure were heavily damaged due to flash floods in Sentani, including 350 houses, three bridges, eight drainages, four roads, two churches, one mosque, eight schools, 104 shops and one market. As many as 11,725 ​​households are also affected, scattered in Sentani, Waibu and Sentani Barat districts, added Sutopo. Head of BNPB Doni Monardo led a coordination meeting and evaluated the handling of Sentani flash flood in Jayapura. According to him, the Indonesian National Defense Forces (TNI) and the Indonesian National Police (Polri) will also be deployed to evacuation centers. Meanwhile, Head of the National Search and Rescue Agency (Basarnas) Bagus Puruhito explained that he would continue to assist in the search for missing people and check and improve the search for victims, adding that heavy equipment is also urgently needed to evacuate and search for victims.